Subjects using the precise CLEAR MUSCLE formula gained 16.3 lbs. of muscle in 12 weeks. The placebo group gained 4.6 lbs. Subjects got significantly stronger when tested on maximum weight lifted on the bench press, deadlift, and squat. Their combined strength increased by over 170 lbs. from the initial testing 12 weeks earlier, which was significantly more than the placebo group. CLEAR MUSCLE™ delivers a revolutionary compound called BetaTOR™ that delivers ultra-concentrated anabolic power in two tiny pills. In fact, you would have to consume 200 grams of whey protein in order to yield the 1-gram dose of BetaTOR™ found in a serving of CLEAR MUSCLE™. What’s more, BetaTOR™ also helps fight catabolism after every dose for superior musclebuilding effects. CLEAR MUSCLE is a novel, never-before-produced supplement that supplies the revolutionary musclebuilding compound called BetaTOR™, which is a unique, cutting-edge free acid derivative of HMB and metabolite of leucine. This compound unlocks the true potential for unprecedented bioavailability, effectiveness, and results. 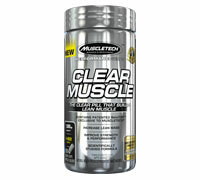 The CLEAR MUSCLE formula is the first to contain BetaTOR™, and is only available from MuscleTech in a clear liquid pill. 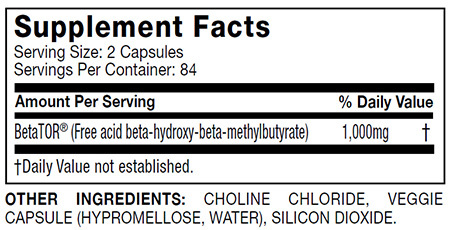 As you can see below, the free acid nature of the compound gives it a viscous, water-like consistency and transparency. In fact, the free acid nature of BetaTOR™ allows it to digest and appear in the bloodstream quickly, and also delivers a superior muscle absorption rate. Once in the muscle, the compound in CLEAR MUSCLE™ activates the anabolic (musclebuilding) process in the muscle called the “p70S6k/mTOR” pathway. This is the universal pathway that must be activated for a muscle to build itself up. The compound also works on a separate pathway – the ubiquitin-proteosome-proteolytic pathway (UPPP), helping to shut down its activity. Normally, when the UPPP is activated, your muscle is broken down (catabolism). But because the compound shuts down (inhibits) the UPPP, muscle breakdown is decreased. So in short, every dose of CLEAR MUSCLE™ amps up your protein synthesis in the muscle while also decreasing muscle breakdown, putting you in the perfect state to build more muscle. In another study, researchers were interested in looking at the acute effects of consuming BetaTOR™ on the mechanisms of muscle growth. Looking at biochemical markers of muscle growth and muscle breakdown, the researchers showed that ingestion of a daily dose of BetaTOR™ all at one time increased anabolic activity (muscle protein synthesis) and decreased protein breakdown by +70% and -58% respectively. The results from their study provide mechanistic support for the overall amazing musclebuilding power of BetaTOR™.